Love it so much that I had to buy another for my daughter!! This lightweight, ultra-quiet vacuum from Shark will keep your home clean and free from allergens. Custom anti-allergen technology makes this vacuum ideal for allergy sufferers and pet owners. Custom swivel steering, adjustable brush height and assorted detachable tools allow removal of dust and debris from even the hardest to reach areas. This sleek red and white vacuum will never lose suction. This vacuum is a sleek powerhouse. My previous vacuum was needing some repair and just seemed too bulky for me now. A friend had gotten a Shark and commented on how great it was. Looked up some reviews which were all positive. 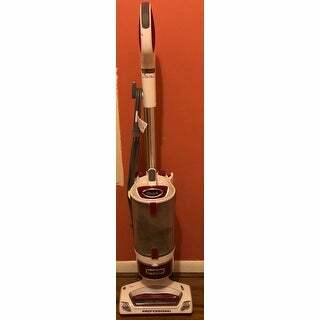 I am very pleased with this vacuum because it is sleek and easy to use whether the upright or the canister feature. The bagless complete seal dust cup is easy to empty. I also like the floor nozzle that works on all surfaces without needing adjustment since I have hardwood floors, area carpet, and carpet runners. With 2 dogs and 3 cats there is a lot of fur to be vacuumed up and the power brush does a great job cleaning their beds. Love my new Shark vacuum! I have only 2 suggestions to improve this vacuum. An auto-retracting cord would be nice, and I have a hard time keeping the attachments getting the attachments to stay in the holders. Even without these fixes, this is a great vacuum - even better than the Oreck I used for 15 yrs! I bought this after doing research because my highly rated Hoover upright that I used in the basement family room and Kenmore canister that I lugged around the rest of the house weren't working and I was expecting weekend visitors soon. The Shark is two vacuums in one- a swivel upright with beater option for rugs and has a roll around base and detachable canister. I have oriental and shag rugs throughout the house on hardwood floors. There's an attachment that makes it easy to switch back and forth between rugs and floors without turning the vacuum off. I have arthritis, herniated discs, and asthma. I was skeptical because it's bagless and was concerned debris would fly around when being emptied- this has not been a problem. The vacuum cleaner is not heavy nor did it even come close to tipping over. I am able to detach the canister easily to vacuum steps and walk around using the attachments. The suction is POWERFUL and easily adjustable. I couldn't believe all the dirt and cat hair it picked up on rugs that my other vacuum cleaners indicated were "clean". I highly recommended this vacuum cleaner and suggest reading the instructions. There's a lot going with this vacuum!!! VERY happy with my Shark Rotator! I did some internet research before making this purchase and the only thing that worried me was the comment that it was top-heavy and tipped easily. My old vacuum had the same problem,but I dealt with it because it cleaned so well. I have two large indoor/outdoor dogs that shed, so I am very particular about the cleaning power and results I get. I was pleasantly surprised when I found that the Shark Rotator was not as tipsy as I feared. In fact, it hasn't tipped on me yet. And it cleans fabulously and at a much better price point than the Dyson. That is the very reason I looked into this purchase was because of claims that it was just as good or better than the more expensive Dyson. I have already recommended this to my friends! I love this viacumm.I've never owned a vacuum that works as well as this one. The quiet motor and the rotation of the machine is great and so easy to use. I bought this vacuum cleaner after the handle on my Hoover "snapped off". For the first time I did research before buying one, and I am SO glad that I did. I was impressed with the reviews and the price was good-if it worked like the reviews promised. It was delivered in 2 days which was great (normal for Overstock.com). It's very easy to assemble and a lot lighter weight than I expected. It has plenty of attachments (I am grateful-I bought an Oreck a few years ago and it didn't have ANY attachments, used only Oreck bags and was hard to push around) and the cord is long enough to clean most of my house without having to plug it in again. I don't remember reading that it was "self-propelled" in the reviews or if it's because it's so lightweight, but the Shark almost vacuums by itself. The head swivels which is quite handy in corners and around table legs. I have two long-haired cats and the amount of hair that was vacuumed up the first time I used the Shark was totally amazing (and embarrassing). I vacuumed my house every day for the first week I had the Shark and I continued getting dirt and cat hair out of my carpet, which is wonderful but doesn't say much for my previous vacuums. I have never been so excited about a vacuum cleaner before, but I've never had one that exceeded my expectations like this one has. The only thing wrong with it-it's a little top heavy when using the wand and can tip over if you pull it by the wand instead of the handle on the top. I wouldn't mind if the hose/wand was a little longer either but overall I am very happy with it and would urge anyone-especially pet owners- to get this vacuum cleaner. You won't be sorry. The title says it all, there's a LOT of vacuuming done in this home. I always thought my house was pretty well kept until I used this vacuum! I vacuumed hours before receiving this shark, but had to vacuum again to try it out I couldnt believe all the dirt and hair that my old vacuum missed! I've vacuumed every inch of my home several times over the past 2 weeks and have yet to be disappointed. 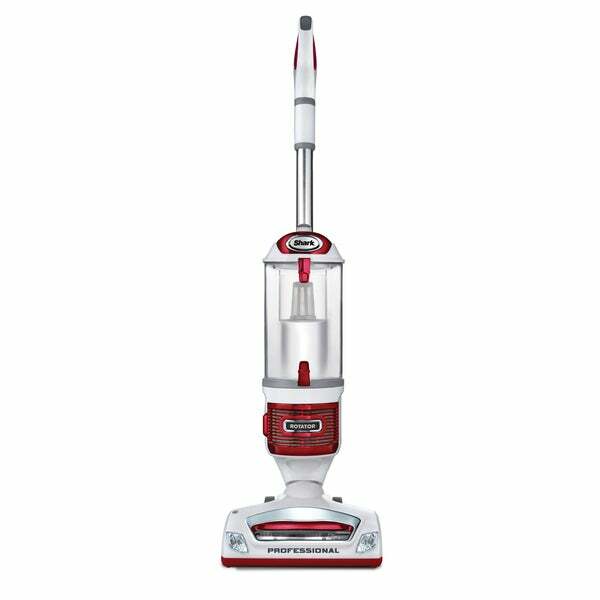 Shark NV501 'Rotator' Upright Vacuum is a very good vacuum I recommend it. Awesome vacuum, we have 2 shedding dogs, a cat and 2 kids. This beast tackles it all. It is lightweight, can be configured into a carried canister, an upright, and the pet tool is fantastic. 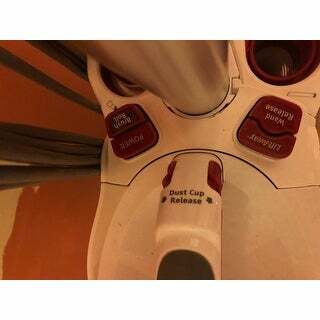 They do not lie, these vacuums do not lose suction, EVER. We compare and contrast our Dyson and Shark, and the Shark is the winner, hands down, every time. I love this vacuum cleaner- I had a different brand that cost 3 times as much as the Shark. The Shark removed pet hair and dirt from my floors that the other model had missed. It is easy to use and does a superb job. A powerful machine- I love it! Have already gotten 4 friends to buy one. Works Sooo good. The first time I used it I couldn't believe how much kitty fur came up out of my carpet. Lots of useful attachments came with it too. Money well spent! I used my new vacuum for the first time today . Wow ! I have 6 house cats & vacuumed just the livingroom & I could not believe the amount of hair it picked up. It is easy to manuver with the swivel function & not heavy & cumberson to push around. I can't wait to try all the dusting & cleaning tools on my ceiling fans, baseboards & much more. I think this is going to be the best vacuum I have ever used & I have had quite a few over the years. Love it. My wife ordered this and so far is very happy with the way to handles the hardwood floor, rugs and carpet. It is fairly light and moves easy but does have good suction. Would buy this item again. had another vacuum with a bag, and thought it may be a major problem in dealing with a bagless model... all it did was shock me, as i saw everything that my old vacuum didn't get...my rug actually looks a true grey again ~ I no longer have to deal with pesky belts that have to constantly be replaced...If that wasn't bad enough, always had to wait for my husband to get home to replace it, as it takes MAJOR upper body strength to put the darn thing into place. You continue to need the upper body strength because the old vacuum (despite having a self propel feature), weighed a great deal.... thanks to my awesome new Shark Rotator and Overstock ~ my old vacuum cleaner is just a painful memory that was easily replaced... appreciate the great deal and service! This Vacuum does it all and does it well. This vacuum is great. It comes with multiple options for various vacuuming needs. I highly recommend it. Love this vacuum. Bought as a replacement for one I previously owned. I have a dog and it picks up the hair great! Lift away canister is nice and you can't go wrong with the bagless feature. I like this vac because it is easy to push and pull. nice design.I don't like the button you have to push to get the roller to move. It does pick up dirt good. I would not buy anything else but a shark.No matter what irks me about a button it is a great vacuum. Picks up all of my pets hair.! Easy to use and to carry around! I LOVE LOVE LOVE this vacuum! 3 dogs, a carpeted 2 story house, and it just picks up all the hair. I have had it for nearly a year now, and continue to be impressed. Easy to take apart and clean the canister and the foam filter. This vacuum looks great. It maneuvers so easily. I love the lights because they work well to help me see under furniture. The suction is powerful and this pulled up more dirt in my carpets than my other good vacuum. The cup that holds the dirt emptied easily. I do recommend this vacuum. Works very well. Fast shipping. We have had it now for close to two years and it still works beautifully. I shed my hair a lot and so does my cat. And it still works well. I call the a keeper! My husband and I really like this vacuum for the price and name. I would have given it a five out of five rating; however, the bottom attachments do come loose if you lift it too high while transporting it from room to room. "Where can you get parts for the vacuum as my handle broke?" "Why doesn't the list of tools included list the tool caddy and the tools included on the caddy? someone asked if it is included and your answer was yes, but unless it is listed how do I know I will get them?" "Is this New? Does it come with the full manufacturer warranty?" Yes, it's new w warranty. This is a totally terrific vacuum! Love it! "Does this vacuum have a relaxed handle, meaning the handle will drop all the way down to the floor so you can vacuum under beds?" yes and no... The handle is relaxed but the canister is right there so you'll need the clearance. our beds sit close to the ground so the canister is what prevents us from getting further underneath. In you have more clearance then yes, no problem. No, this won't fit under a bed with the canister. This vacuum has decent suction, but it's really top heavy and awkward to use because it tips over easily. I would not have purchased it had I been able to try it first. "I see pretty good reviews and specs, however, no one ever mentions where the on/off switch is located. I would like to know where it is located." It's a great vacuum. the power button is on the back/top portion of the canister. If you're looking at the picture, it's behind and off to the side of where is says "Shark" at the top of the canister. "What is expected delivery time?" "Is this the 3-1 with the canister, upright and hand held model? All the research I have done shoes model NV501 as the 3-1, but then the item description only shows this as an upright. The video makes me think it is the 3-1, but then a lot of the reviews don't talk about it at all and the items description doesn't seem to mention all the extra parts I thought the NV501 comes with." This model features 3 vacuums in 1, powerful upright, lift-away pod for portable cleaning and a convenient canister vacuum. it is all of the above. You can use it as an upright or lift the canister and walk around or place the canister in the caddy and use it as a pull behind model.